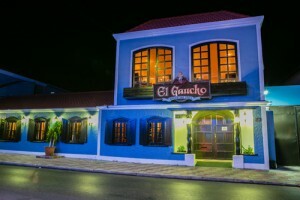 El Gaucho is located in a colonial townhouse on Wilhelminastraat #80, the first Argentine restaurant to open its doors in Aruba on February 17,1977. El Gaucho Restaurant serves a variety of tempting dishes, featuring quality Argentine steaks, tender and juicy, charcoal-grilled to perfection. Some of our specialties include the famous Gaucho steak, 16 oz sirloin, Pincho Torro Caliente, the biggest shishkebab ever served, T-bone steak, veal chop and more. While many restaurants are currently serving Churrasco steak, we must say that our version is the original and always the very best. Our professional and friendly staff will pamper you while you enjoy the finest Argentine meats. Our strolling guitarist duo, Carlos & Jonathan Sanchez, entertain weekdays with romantic tangos and boleros, while guitarist Placido Garcia enchants guests on Sundays. We also serve excellent, Aruban flavored, fresh seafood platters. And while savoring any of our dishes, from juicy steaks to shrimp, enjoy one of our exclusive Argentine wines, from our well stocked cellar. The rustic traditional décor, in the private dining rooms honors the legends of the Argentine cowboy.